A unique gift for anyone who works with a miscroscope or cells! These laser cut, biology inspired works of art and utility, are a lovely set of decorative cellular pattern coasters. Made from American Black Walnut veneered board, they make an excellent present. The stylish and cool pattern features a computer generated design. The pattern was “grown” inside a computer program, which was tweaked to produce something you might see through a microscope. The minimalist packaging then hints at what’s inside. The organic pattern combines with high tech wizardry and traditional materials, to create an object almost too good to rest your drink on! Each coaster and placemat is laser cut from 6mm American Black Walnut board before being hand finished. After the design has been laser cut from the wood, each piece is hand sanded and then given a coating of an oil and wax mix – for maximum protection and to accentuate its finish. They are protected with a water based and non toxic finish, safe even for the most sensitive skin. 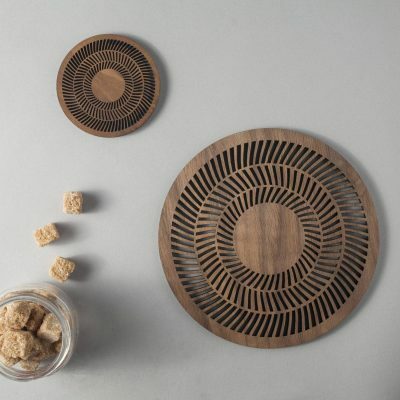 The finish extends the life of your coasters, and thus of your table itself. Guaranteed to appeal to doctors, researchers, scientists, lecturers, medical students, or indeed anyone with an interest in cell patterns. Coming complete with a sturdy laser cut and hand assembled navy blue pinstripe card box, these coasters are a perfect gift for style lovers, or even a present for yourself!